The Oplomochlion was the manikin demonstrating the mechanical principles to be observed in making and fitting artificial limbs, engraved in the famous Opera chirurgica (1617) by Girolamo Fabrizi d'Acquapendente1. 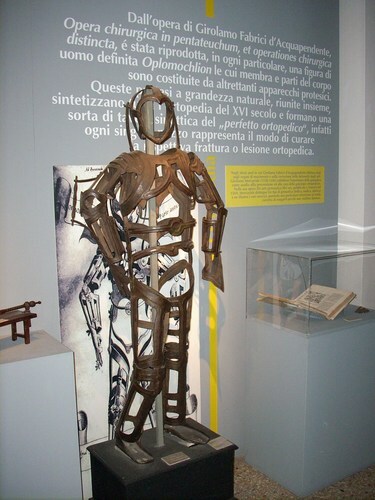 A very accurate iron reconstruction of the Oplomochlion can be admired in the Museo di Storia della Medicina in Rome (Viale dell'Università, 47/a), as an evocative display of seventeenth-century orthopaedic prosthetics' state of the art. 1. See W.F.Bynum and Helen Bynum, Dictionary of medical biography, Greenwood Press, Westport (CT) 2007, vol. 2, p. 472.